With the University of Maine Hockey team beginning their push into Hockey East regular season play, thousands of fans will pack Alfond Arena on the Orono campus in the coming weeks and months to cheer our boys onto victory (and perhaps the playoffs). And while the Black Bears enjoy one of the best home rink atmospheres in the country, things weren’t always the loud and cavernous environment that we’ve grown to love. For this Throwback Thursday we take a look back at a much simpler and smaller Alfond Arena in it’s opening season. I’ve done articles on the original Alfond Arena before, but this picture from the inaugural year of the facility in 1977 gives an inside look at just how small a building it used to be. No student or band section overhanging the ice. No skyboxes at the opposite end of the ice for the likes of Stephen King and others. No wings of seating for the Naked 5 to ran past carrying their Maine flag. To say the original facility held 3,800 people may have been generous considering most of the arena had just 8 rows deep of seating. I can remember going to see the Black Bears take on the US Olympic Team in Orono in 1988 (I believe) and I’m glad the fire marshal looked the other way because it was standing room only around the entire arena. 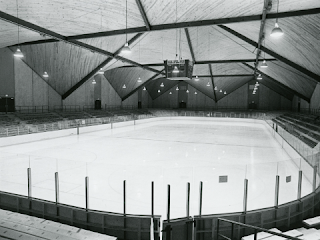 While Alfond has grown to over 5,600 seats the original arena design is still what makes it great from the parabolic roof shape to the wood slats on the ceiling. It is still hard to believe that Maine’s historic hockey program had such humble beginnings in the only building they’ve ever called home. Shop the FTS Store now! About "Fill The Steins": A multimedia platform devoted to providing an informative, entertaining forum that celebrates "the college of our hearts always" and its graduates' contributions to academics, athletics, and popular culture, as created by alumni and students, for alumni and students. FTS is not affiliated with the University of Maine or UMaine System and does not represent the views or opinions of the university in any way, shape, or form.